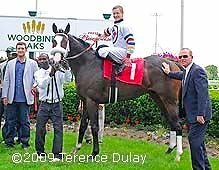 The $500,000 Woodbine Oaks Presented by Budweiser kicks off the Canadian Triple Tiara for 3-year-old fillies foaled in Canada, which continues with the Bison City and then the Wonder Where. However, several Oaks winners have instead gone on to compete against the boys in the Queen's Plate, which is run exactly 2 weeks later. A field of 13 (after supplemental entry High Mist scratched the morning of the race) went to post in this 1 1/8 mile Polytrack feature, on a cloudy afternoon with temperatures in the 60's. 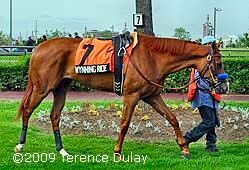 California invader Wynning Ride shipped in for trainer Bob Baffert and was sent off as the 2-1 favorite exiting two straight 2nd place finishes, in the Hollywood Starlet in December and then an allowance in May. Regular rider Joe Talamo was in the irons, his first ever mount outside the U.S. In to challenge her included top local hope Tasty Temptation at 3-1, a close second in the La Lorgnette last out for trainer Mark Casse, and 9-2 Milwaukee Appeal, winner of the Star Shoot then third in the La Lorgnette in her final prep. Milwaukee Appeal starts to draw away in the stretch over Tasty Temptation with the rest far back. 31-1 Koonunga Hill was sent to the front first time past the stands by jockey Emma-Jayne Wilson and she set easy fractions of 23.73, 48.01, and 1:13.12 while as many as 2 1/2 lengths ahead of Milwaukee Appeal, who in turn was 2 lengths in front of 75-1 longest shot Indigo North in third around the clubhouse turn and down the backstretch. Entering the stretch, Koonunga Hill tired and faded to finish 12th, as jockey Patrick Husbands sent Tasty Temptation, 11th early, out wide for the drive. Tasty Temptation headed Milwaukee Appeal at the 1/4 pole but Milwaukee Appeal was up to the challenge, kicking clear through the final 3/16 mile to win going away by 3 3/4 lengths in a time of 1:49.84, just 0.55 second off Palladio's track record set last October. It was a long 5 1/2 lengths back to 7-1 Miss Blakely who held off late-running favorite Wynning Ride by a nose for third. 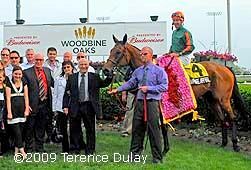 This is the second year in a row the Woodbine Oaks was won by a daughter of Milwaukee Brew, after last year's edition was won by Ginger Brew, and the final time was the fourth fastest in stakes history. 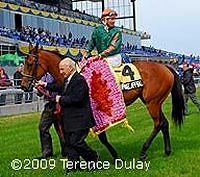 Left: Milwaukee Appeal in the winner's circle. Winning jockey Stewart Elliott, riding the filly for the first time, said, "Actually, no I didn't (watch videos of her races, because of) travelling and everything.� I got here and I looked at her paper and you could tell she was honest, she was always right there.� Mr. Fairlie pretty much told me the same thing, she's easy to ride, she'll stay close, and she'll do whatever you want.� It was very nice.� I thought we were going to be in front the way she came out of the there.� She settled, rated, and finished great when I needed her too. I always love it here.� It's such a beautiful facility. It's always nice to come back especially when you win. You win the Derby and people know who you are." 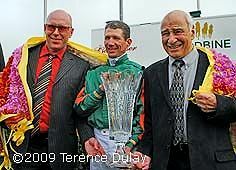 Right: Winning trainer Scott Fairlie, jockey Stewart Elliott, and owner/breeder Eugene George of C.E.C. Farms pose in the winner's circle with the trophy and flower blanket. Left: Milwaukee Appeal is paraded for the fans by owner/breeder Eugene George. 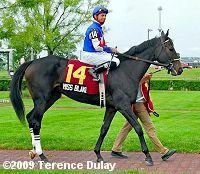 Winning trainer Scott Fairlie said, "Going 1 1/8 for a lot of them it was their first time.� So a lot of them took back and waited. 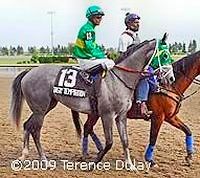 I think Stewart rode a hell of a race and just left the filly alone, she was laying second when Tasty Temptation came up beside and she just kicked on. 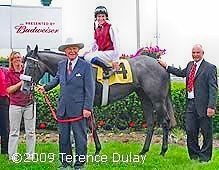 She's improved and she continues to improve.� Mentally, she got immensely better.� She was down in Florida with the Bobby Wingo family, trained there over the winter where she was broke and he did a hell of a job with her." Right: Milwaukee Appeal gets hosed off after the race before heading to the barns. Left: Milwaukee Appeal acted up a bit in the walking ring before the race. Here she is actually air born if you click to see the larger version and check out her back feet. Right: Milwaukee Appeal looking calm and collected in the post parade. 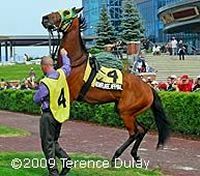 When asked what was up next for her, trainer Scott Fairlie said, "We're probably looking at the Bison City.� But we'll look at the filly in the morning and worry about everything else in the morning." Right: Third place finisher Miss Blakely in the walking ring before the race. The 7-1 shot broke outward and raced in midpack sixth early under new jockey Eibar Coa, closed well on the turn and was all out to hold off the favorite for third place money, but beaten 9 1/4 lengths at the line. The Joe Orseno trainee improved her record to 3 wins, 1 second, and 1 third in 6 starts, earning $116,302 for owners Capitol Hill Thoroughbreds and Team Five Star Stable. Left: 4th place finisher and beaten favorite Wynning Ride. The 2-1 favorite raced off the pace in 9th early under regular rider Joe Talamo, came out 5 wide on the turn and into the stretch, and finished all out to get fourth, missing third place by a nose. The Bob Baffert trainee has a career record of 1 win, 2 seconds, and 0 thirds in 5 starts, earning $159,700 for owner Arnold Zetcher. Right: Shortly after the start of the race with Milwaukee Appeal out front. #8, Koonunga Hill, passed her right after this and was the leader by the first call after a quarter mile. The first stakes race on Oaks day was the $150,000 Victoria Park Stakes for 3-year-old males going 1 1/8 miles on the Polytrack, with just 4 going to post. 5-2 second choice Life Goes On set a pace of 50.07 and 1:14.00 before 2-5 favorite Awesome Rhythm, who raced in third early, easily passed the pacesetter to gain the lead at the 3/16 pole. Under a hand ride by jockey Jim McAleney, Awesome Rhythm drew off to win by 8 1/2 lengths over 6-1 Counter Move in 1:51.12. It was another 1 1/4 lengths back to Life Goes On third, and 12 1/2 more to 18-1 Mensch last. 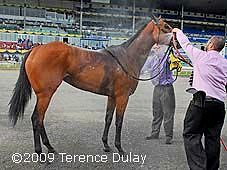 His trainer John Ross said, "He was a gangly 2-year-old. He's grown and developed and filled out. Jimmy figured the horse out beautifully because when you're going long, the key is getting them to relax, take that deep breath and be able to kick on. He came out of his last (race) really well. Then he worked better than I had ever seen him." 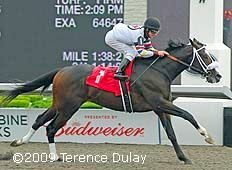 Jockey Jim McAleney added, " He's a multi-faceted, talented horse who is right on top of his game. When you look at those splits, he finished up in 1:51 off of a pace that was walking. Had we moved sooner, had a pace to run at or if I had really set him down, he might have gone quicker than 1:50 and that's something to say." A field of 9 three-year-old fillies sprinted 6 1/2 furlongs on the turf in the $100,000 Alywow Stakes. 7-2 second choice Woodsmoke was loose on the lead down the backstretch through fractions of 23.17 and 46.24. Entering the stretch, she held a 2 length advantage but 7-4 favorite Pull Dancer, last early, had saved ground on the turn and was quickly closing the gap on the inside. 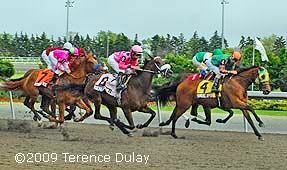 The pair hit the line together, but the photo showed that Woodsmoke held on by a nose in 1:15.44 over the firm course. It was another length back to 9-1 Retraceable third. Her trainer Mike Keogh said, "I was just hoping she could hang on because it is such a long stretch for a front-runner. 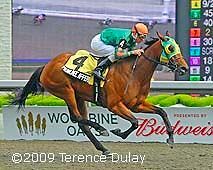 There's a nice race, foaled in Ontario, called the Ontario Damsel going 6 1/2 furlongs on the turf (July 5)." 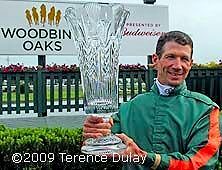 The Avelino Gomez Memorial Award, Canada's equivalent to the George Woolf Award in California and the Mike Venezia Award in New York, is a lifetime achievement award for a jockey, Canadian-born, Canadian-raised, or a regular rider here for more than 5 years, who has made significant contributions to the sport. 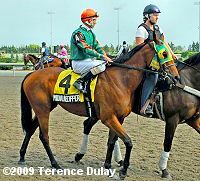 The 2009 award went to Robert King, Canada's top apprentice jockey in 1983 and 1984 and won 4 consecutive Ontario meet titles. King won 1,349 races, 37 stakes races, and also saddled 29 winners as a trainer. 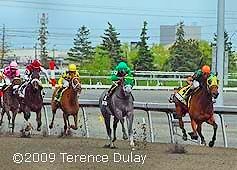 Currently he is the National Secretary-Manager of the Jockeys' Benefit Association of Canada. The trophy was presented to King by Jacqui Gomez, daughter of Avelino Gomez. 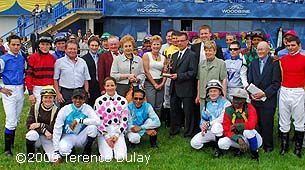 Accepting the trophy, he said, "I would like to thank the Gomez family and the Award committee for presenting me with this trophy, named in honor of Avelino Gomez, Canada's most colorful jockey. I would like to thank all my agents for their guidance and insight, and my fellow jockeys for years of camaraderie. 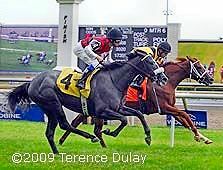 Particularly, I would like to thank all the unsung heroes in horse racing: grooms, hotwalkers, exercise riders, vets, valets, blacksmiths, racing officials and management, who pour their lives into this great game making it all possible, for they are not duly recognized for their hard work and dedication."